I will show you three simple steps you should apply and save some amount of mobile data while streaming any video on YouTube. 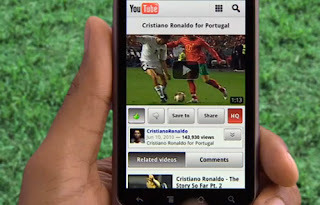 YouTube is the world's largest platform for sharing videos of all kind. The video database on YouTube is so huge that you will be confused of what to watch once you have data (MB) on your phone or PC. New videos are been added every minutes to even increase the numbers and new subscribers keep signing in and uploading videos of all kind. Some videos records amazing number of views under few months on YouTube. Examples of such videos are Justin Bieber's "Sorry", Niki Minag's "Anakonda", Psquare's "Personally" to mention but a few. However, one major thing that always scare people away from streaming videos on YouTube is the way the site or the app su.cks data. It consumes a lot of data under few minutes of streaming a video. Considering the high cost of data subscription, no person would like to exhaust his or her data on YouTube no matter how interesting the video is. This is a common question among users of this video streaming database. They keep on wondering why too much data is been spend watching a movie on YouTube than watching the same movie on Mobdro. Well, the truth is not far fetched because the major cause of the high data consumption on YouTube is that at default, all videos are set to stream on HD (High Definition) format meaning you will enjoy a clearer view and nice sound quality but you pay back with your data. HOW DO I SAVE MOBILE DATA WHILE WATCHING YOUTUBE VIDEOS? That's all. What you just did is telling the app to always use the standard medium video format whenever you are watching videos. This can save up to 50% of your Internet mobile data while you are on YouTube. Remember that most times the effect won't be really noticeable as the picture and sound qualities will still be clear enough. Meanwhile, the HD streaming will be reactivated anytime you are connected to a WiFi network. Nice bro. Always on point and thanx for the tip. Great Tips for those who love watching videos online like me. Thanks for the informative article but i hardly stream any video via YouTube. Vidmate is there for me to use in searching and downloading any video of my choice.